If you haven’t visited and bookmarked my online store yet, you can find it zazzle.com/jmdesantis. As stated, it lists about 100 items right now (with more to come in the New Year) a number of designs, six of which are from the Gentleman Cthulhu web-comic. Besides Gentleman Cthulhu, you can also find the “flowers” design from the popular And They Call it Mummy Love series and both panels from the second comic about a vampyre about to bite a woman’s neck (the punch line of which I won’t spoil). Honestly, so far Gentleman Cthulhu merchandise has (maybe somewhat unsurprisingly) been the best selling. If you want to browse the Gentleman Cthulhu merchandise specifically, you can find them here: zazzle.com/jmdesantis/gifts?cg=196227363645029268 (though, you’ll have to visit the Vampyres category to find those aforementioned vampyre artworks). 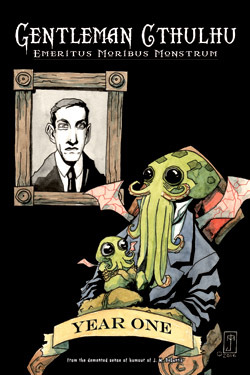 That said, I’ve finally put my submission in with Ka-Blam.com (who I use for my comic printing) to list Gentleman Cthulhu: Year One on their IndyPlanet store (both for digital download and print). Unfortunately, it hasn’t posted yet, but as soon as it does, I’ll be sure to make an announcement on social media–so follow me there if you haven’t already. I’m hoping to get the book listed on other sites in 2017, but having worked with IndyPlanet before (for Chadhiyana #0) so this seemed like the fastest way to make it available online. So, with all of these options and the Holidays upon us, consider purchasing something from the store or a Gentleman Cthulhu: Year One for a friend or loved one this year. I’m sure they’ll enjoy it.